The use of the Internet and popular software to connect individuals in efficient communications networks is often referred to as “social media." These popular applications include but are not limited to Facebook, LinkedIn, Twitter, YouTube, Vimeo, Instagram, Pinterest, and Google+. Misericordia University feels it is appropriate to have an institutional presence in these various media in order to facilitate communication among important constituency groups. Risks are involved in participating in such endeavors and therefore the University has developed a set of policies and guidelines to regulate all official behavior on such sites. In order to represent any official department or sanctioned function of the University in a social media platform, that department or entity must first make application to the Marketing office using the social media form found on myMU (MU's internal web portal). It is also highly recommended that all entities seeking or currently maintaining a presence on social media meet with a marketing representative to review important aspects of their account including but not limited to site goals, ongoing maintenance, and other general rules as set forth in this policy. All institutional pages must have a full-time employee who is identified as being primarily responsible for content. Ideally, this should be the unit head of the department. This person will be contacted in the event there is a problem with the site or a posting. A secondary site administrator must also be identified. This person(s) is responsible for all content and behavior on the site even if day-to-day tasks are delegated to others. Application should include the name, title, department or organization name, email, and phone number of both the primary and secondary administrator. If the site is already operational, please list the current URL and date the site(s) was launched in your application. Only accounts that are officially approved by the marketing department through this process will be listed on the Official Social Networking Sites page. Before you start a page, have a specific purpose and action steps for how to use it. Too many web pages and social media sites are launched but then not maintained as priorities shift. If you decide you no longer want to use a page, don't simply abandon it. Identify that you are shutting down, gradually move your users out, then turn off the page. Few things are worse to the public than seeing a web page or social media site that is live but far out of date. The Marketing department will take steps to shut down social media sites that are inactive for 90 or more days. If you already have an official, functioning social media site(s), you must still apply to the office of Marketing and be listed in an official directory of MU sites. Marketing will periodically audit all sites for content and activity. Always identify that you are representing your department at Misericordia University in a professional capacity and act and communicate as if that is the case. Your behavior online will be evaluated as if you were speaking in public representing your department and all relevant policies on behavior and decorum apply. Do not use University sites for personal purposes: Misericordia social media sites are for the dissemination of official university content and should not be used for personal purposes. 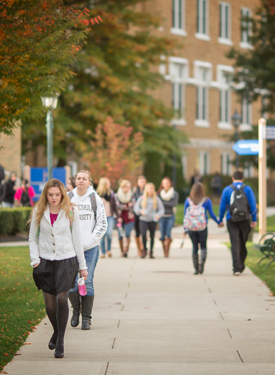 Link back to the university: It is required that each official social media page link back to the Misericordia web page or other Misericordia online assets. Protect the institutional voice: Your posts should always remain professional in tone and in good taste. No department web site should act as if they represent Misericordia University as a whole, especially on subject matter for which they have little or no administrative responsibility. Consider this when naming pages or accounts, selecting a profile picture or icon, and selecting content to post. Icons, Images, and Geofilters: All icons, images, and geofilters used to identify or enhance official social media pages or those portraying as official pages must be approved by Marketing web Content and Cougar Prints staff. Posting Length: All posts should be relatively short and direct. Only in rare cases is a social media outlet the appropriate place to share lengthy, detailed correspondence. Non-MU Posts: Misericordia University does not allow posting of commercial content, promotion of other businesses not affiliated with the university, or solicitation for participation in private studies on its social media sites unless otherwise authorized in advance. This includes unsolicited discount offers to students, staff, and alumni, rental property availability, personal employment offers, random tagging of content or pages unaffiliated with MU events, selling of personal items such as book or dorm related materials for financial gain, partnerships or agreements and similar activity. Fundraising solicitation requests, other than those coming directly from MU or an MU sponsored program are not allowed. Non MU posts will be deleted. Offensive posts: Offensive or abusive posts should be removed immediately. Site administrators should note the source of the post and consult with their next level supervisor and Marketing to determine if additional action is necessary. Confidentiality: Remember to always protect student and employee confidentiality when posting to social media. If the information you are posting could not be shared publicly, such as in front of a large group of people, then it likely does not belong on a social media site.